Flowers are blooming, sun is shining, and spring is in full swing where I live! 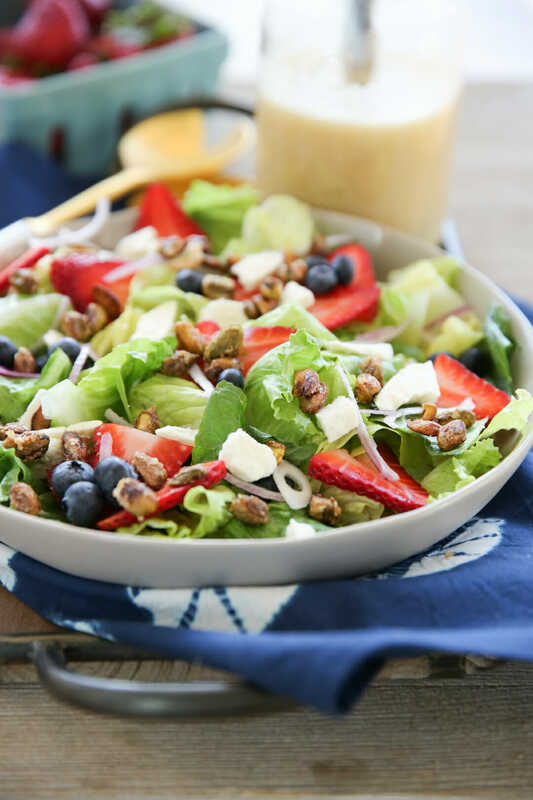 I created this Honey Lemon Vinaigrette recipe specifically for spring and summer salads full of fresh fruit, like juicy berries or peach slices. It’s naturally sweetened with honey and fresh lemon juice and zest gives it a really bright flavor. Are you spotting those Candied Pistachios from last week in there too? If you’re not making your own salad dressings, you’re missing out. Don’t get me wrong- I’m not opposed to store-bought dressings; I have a fridge door full, but there is something SO much better about a homemade dressing and they’re deceptively easy to make! Hopefully you should all know by now that bottled lemon juice should only be used for canning- always use fresh lemons for cooking! You’re going to include the zest in this recipe, so make sure you zest the lemon first and juice it after. 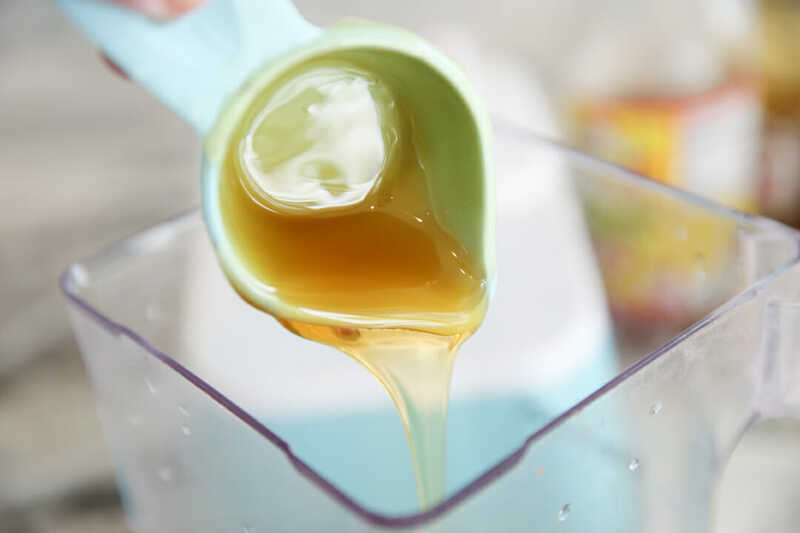 There’s no added sugar in this sweet and tangy dressing, just silky honey which adds flavor along with the sweetness. You’ll combine lemon and honey, along with a splash of cider vinegar, garlic, salt and pepper and a touch of mustard and then drizzle in the oil. You can use any good salad oil you like. Canola is a great choice for basic dressings that really lets all the great flavors come through. 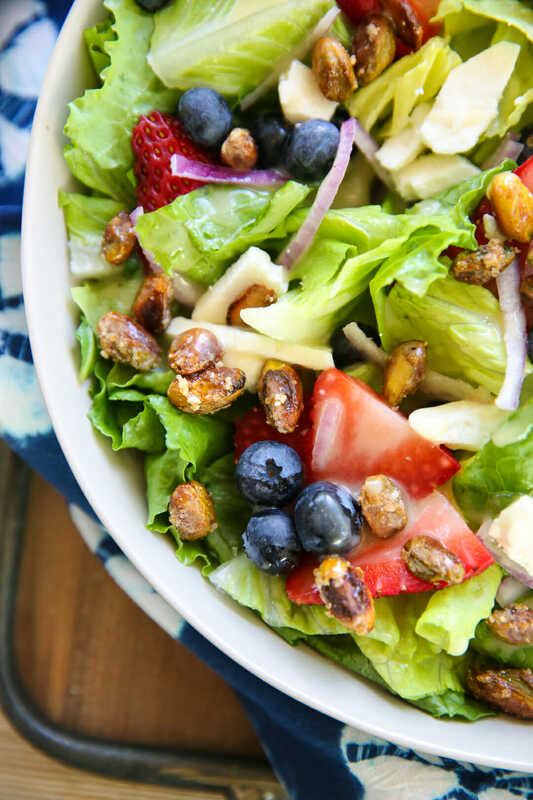 I tossed this with crunchy romaine and topped with sliced strawberries, blueberries, red onion, tangy feta, and candied pistachios. It was the perfect combination of sweet, savory, and tangy. 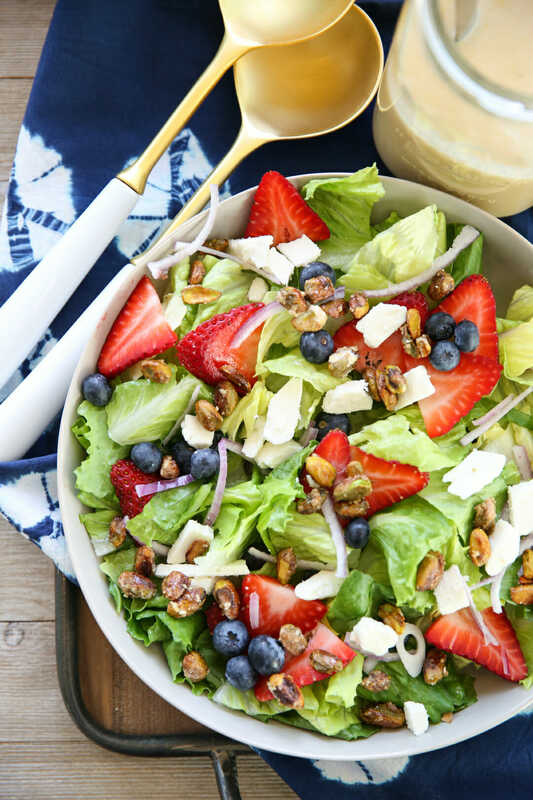 We’re big fans of homemade salad dressings around here and we have a huge collection, which you can see by clicking here! 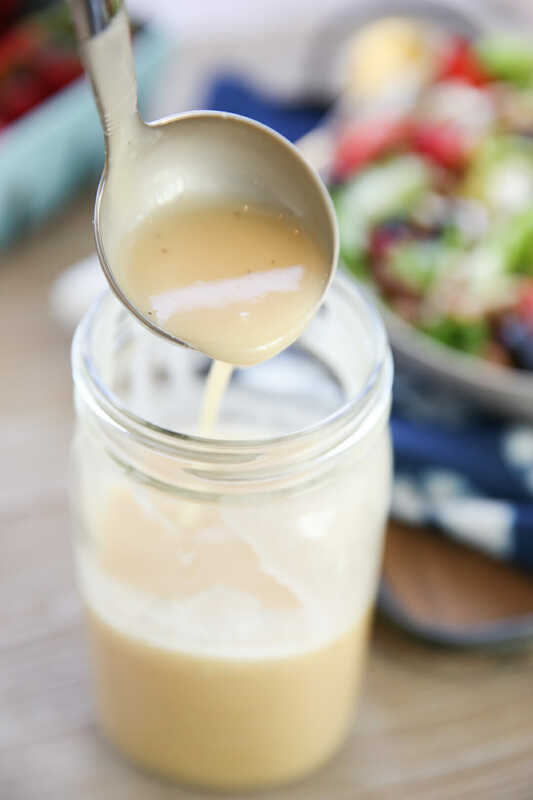 This tangy, sweet Honey Lemon Vinaigrette is perfect for spring and summer salads! 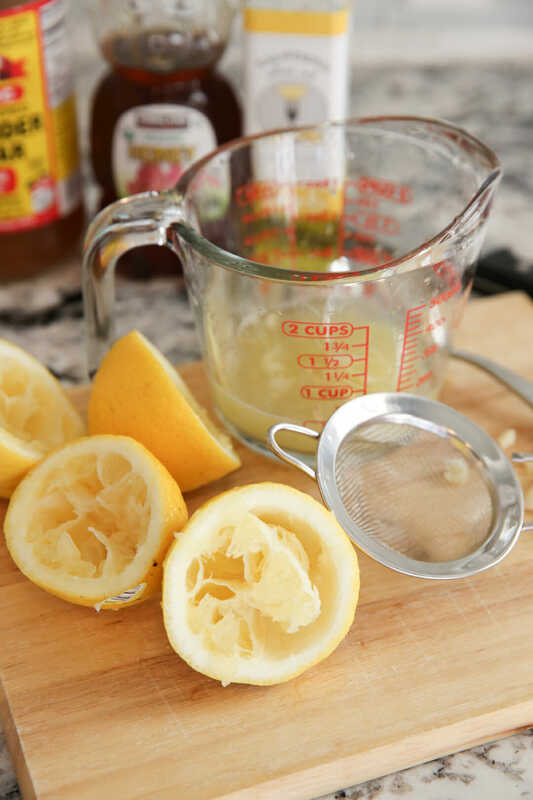 Combine lemon zest and juice, vinegar, mustard, salt, pepper, and honey in a blender. Blend until smooth. With blender running on low speed, slowly drizzle in oil until emulsified. Store in fridge when not in use. Yields a little over 1 cup. Sounds terrific, but wouldn’t a good olive oil be better than a heavy canola? You are welcome to use a good olive oil. The difference is that canola is a flavor-neutral oil and in a dressing like this with some mild flavors of honey and lemon, they just come through better. I love olive oil (we own an olive oil company!) and I’ve made this lots with our own Lemon Olive Oil and it’s delicious, but it does have the distinct flavor of olive oil, which some people may or may not like in this dressing. Could you recommend a healthier oil to use that is neutral in taste and could yield similar results? I would do a light olive oil (light just refers to the amount of olive flavor, so it won’t be as strong) or avacado oil probably wouldn’t be bad either. Yum! I totally need to try this! And that salad looks amazing! This looks wonderful! Do you have the specific amounts for lemon juice, cider vinegar, mustard and oil? Hey Helen! We had a weird technical glitch that wasn’t displaying the recipe! It should be all there now- let me know if you have any trouble viewing it now! Thanks so much. All is well!!!!!!! This looks so delicious! I am so ready for spring and fresh salads! I can’t wait to try this! You got me at “honey and lemon”. 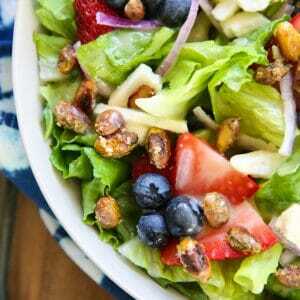 Will be trying this recipe this week.. Love making my own salad dressing as opposed to store bought. So fresh and no extra ingredients. This dressing is sooo good. I think it might be my new favorite dressing. It’s so light and fresh tasting. Thanks for the recipe. Next Post ❯ Next post: Happy Mother’s Day!